Tonight’s guest is again Brian Peters, traditional folk singer and well-respected anglo concertina and melodeon player. Tutor once again at this year’s Swaledale Squeeze. David Cornell, an excellent player/arranger of tunes for the MacCann Duet concertina, wants his arrangements to be available to other Duet players. He is now very ill and unable to take any steps to make this happen. Many of his arrangements are already available as pdf versions at http://www.concertina.com/cornell/ Now, thanks to the efforts of Lesley Henniker, some 30 are now available as sound files and can be found at https://soundcloud.com/user-655309308 – more will be added as she selects and records them. This was discussed at the Duet concertina workshops at the Swaledale Squeeze this year, particularly with Iris Bishop, Paul McCann, Lesley and myself, and we would like you to put links to both these websites from the page http://www.concertina.org/sound-archive/. … with MC Paul Walker. Tonight’s guest is Brian Peters, purveyor of traditional folk songs & well-respected player of both the anglo concertina and melodeon. Many of our readers will remember him as a tutor at the Swaledale Squeeze. Details have been pubished in last Concertina World 465 magazine. 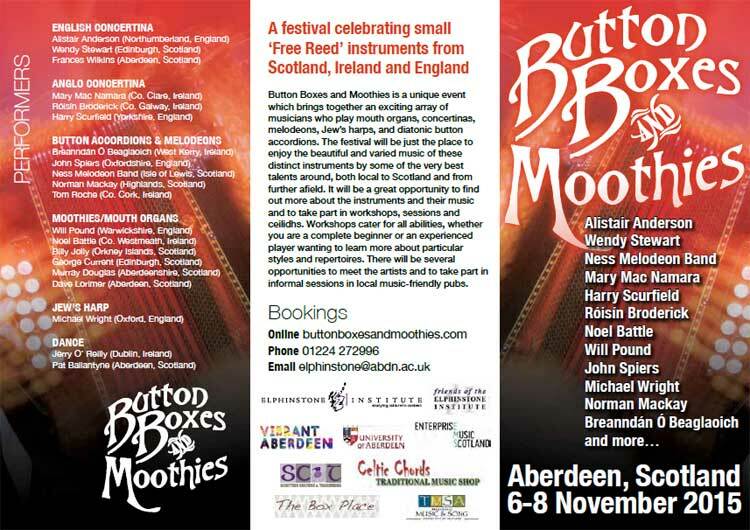 Our Honourary President, Alistair Anderson will be with us for the meeeting and will be giving a workshop on Northumbrian Tunes suitable for all concertina systems in the morning. Evening concert by Alistair Anderson with special guests. Just in case you found the prices quoted there confusing, note that they are given in concertina pounds. The members price for the concert of ¢ 5 comes out as £ 5 if you pay in sterling. And best wishes for 2016 to all! This will be our 17th annual SSI, regularly held the last full weekend in April. A description of the event, further contact information, booking and other details can be found on the web site. When pubs/bars over the UK are closing at a rate of knots – and with them the sessions & folk clubs they house – the one place folk music is flourishing is the INTERNET, where you can read about and listen to artistes old & new. Here to discuss with me some offerings from the Internet (over a virtual pint of Pendle Witch) is my old mate Nigel Harbron, singer/ songwriter/folk journalist who runs a session in Cumberland.